A few weeks ago I attended a free event at the Waterstones on Tottenham Court Road in London which was the launch event of the book Bloom by Estée Lalonde which included the author (a well known youtuber and blogger) in attendance doing a live Q&A in conversation with blogger Emma Gannon. I was in London that day anyway for the London Film Festival and since I have been watching her videos for a few years (as well as enjoying the book CTRL ALT DELETE: How I Grew Up Online by Emma Gannon) it seemed like the perfect opportunity! The atmosphere was very friendly there were around 30 people there (mostly female) and everyone was a similar age. I really enjoyed the Q&A it was warm and funny and I got to meet Estée afterwards for her to sign my book. I recently finished reading it, it only took a few hours due to the spaced-out magazine style of the book filled with loads of gorgeous photos. I definitely enjoyed the first half the most, in which Estée is the most personal talking about her past, relationships, and mental health. The second half is very much focused on fashion, lifestyle, and beauty most of which is similar to things you can find on her youtube channel or blog. I think you could classify it as a coffee table read as it’s very dip-in-dip-out and visually pleasing. Overall, I enjoyed the book and would recommend to anyone who enjoys her online content. Author emilysteelefilmPosted on April 13, 2014 April 13, 2014 Format GalleryCategories My Work, PhotographyTags camden, camden market, graffiti, london, photographyLeave a comment on Camden Market Graffiti Photography. 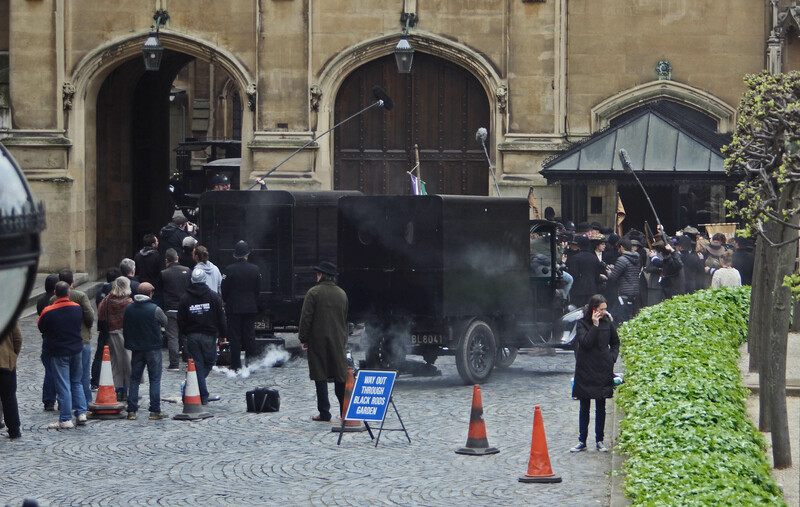 When I was in London yesterday I stumbled upon the set of the film “Suffragette”. They were filming outside the Houses of Parliament, the film stars Carey Mulligan and Helena Bonham Carter who were present there for the filming and I saw them coming out to start filming. IMDB describes the film’s plot as “The foot soldiers of the early feminist movement, women who were forced underground to pursue a dangerous game of cat and mouse with an increasingly brutal State.” I think that it’s fantastic that a film is being made about the struggle these women faced to get the vote. “Suffragette” is fictional but inspired by the suffrage movement and real events. Interestingly, this is the first time the Houses of Parliament have been used for filming a commercial film. All previous films and television shows have used sets.